KGS Semi Flexible Silicon Carbide discs are often used in the stone industry for creating beveled edges or other adjustments on granite and very hard stones. The new MO version (also called the KGS Granite Disc) is specially designed for heavy duty grinding on granite. Please refer to below video for more information. We advise type C (Black Silicon Carbide) for these applications. Alternative is the CV version (Green Silicon Carbide) for the same application. 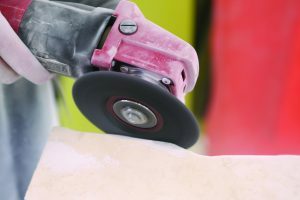 KGS Semi Flexible Silicon Carbide sanding discs are used for creating beveled edges or dimensional corrections on marble, and other types of natural stones. For shaping of marble sculptures, slabs, blocks and also on granite monuments, sandstone, limestone and terrazzo.